The village sign, seats and basework was completed in 2000. The sign was unveiled on 17th June 2000 as part of the village Millennium celebrations. 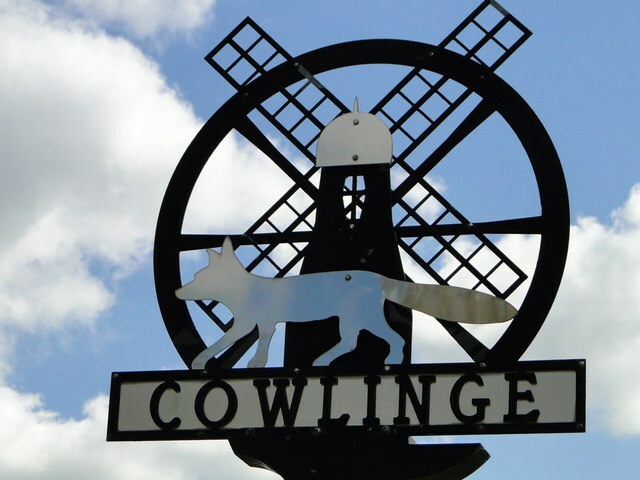 The sign depicts several of the rural crafts and businesses that Cowlinge has had over the centuries before. There is the ubiquitous windmill with its window in the shape of a coffin to remind us of the village undertaker. There is a wheel to remind us of the wheelright and a fox depicting the Silver Fox Farm that used to be in the village. Also the whole sign sits on top of an anvil to remind us of the blacksmith.